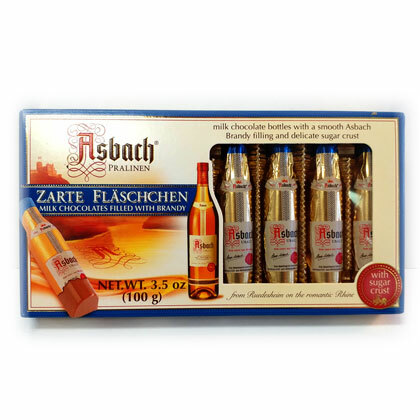 Asbach Pralinen Uralt 8 filled bottle shaped chocolates with a liquid Asbach filling enrobed with finest milk chocolate with sugar crust. Recognized by connoisseurs to be the ultimate in filled chocolates. Product of Germany. 3.5 ounce gift box. Approx. 8 inches wide and 4 inches tall. MUST BE 21.